If you purchase eggnog from the grocery store, you can typically expect that it has been pasteurized to eliminate Salmonella, meaning that it has been heat-treated to kill harmful microorganism. To be sure, you can check the label or ask a clerk if the product is pasteurized. Question: I really love to drink eggnog this time of year. But as I learn more about raw eggs and their link to Salmonella, I’m worried. Is it safe to drink eggnog? 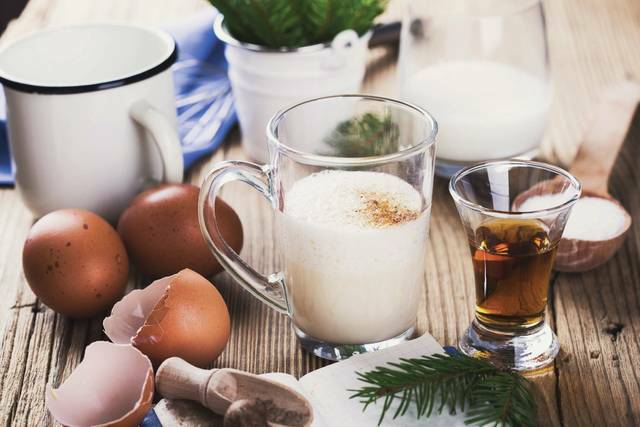 Eggnog is a favorite holiday drink for many people, but because it is sometimes made with raw eggs, you should be aware of the risks and ways to improve the food safety of what you are drinking. This is especially true if you have a weakened immune system or are a young child, a pregnant woman or an older adult. Eggnog is a popular sweetened dairy-based drink that is traditionally made with milk, cream, sugar, whipped eggs and spices. According to a 2007 report from Indiana University’s Kelley School of Business, consumers drink some 122 million pounds of eggnog, with peak sales occurring the week before Thanksgiving, the week of Christmas and the week just after Christmas. A possible concern is that eggnog made with raw, unpasteurized eggs could contain Salmonella, which is a pathogen that can cause foodborne illnesses. In fact, Salmonella typically causes a million foodborne illnesses in the U.S. each year, resulting in some hospitalizations and even some deaths, according to the Centers for Disease Control and Prevention. Salmonella can cause people to develop diarrhea, fever and abdominal cramps within 12 to 72 hours of infection, with the symptoms typically lasting four to seven days. In some people, the diarrhea can be so severe that it leads to hospitalization or even death, the CDC says. So if you purchase eggnog from the grocery store, you can typically expect that it has been pasteurized to eliminate Salmonella, meaning that it has been heat-treated to kill harmful microorganism. To be sure, you can check the label or ask a clerk if the product is pasteurized. But if you are planning to make your own eggnog or drink eggnog that is homemade by someone else, there are some precautions you can take. It’s important that homemade eggnog is made with a cooked egg base, according to Foodsafety.gov, which offers food safety information from the U.S. Department of Agriculture, the U.S. Food and Drug Administration, and the CDC. The egg base mixture for eggnog should be gently cooked to an internal temperature of 160 degrees Fahrenheit, stirring constantly. This will kill Salmonella that may be present in the egg mixture. After cooking, the egg mixture should be chilled before adding it to the milk and other ingredients, according to Foodsafety.gov. You can also use pasteurized eggs or egg substitute to make eggnog, although both FDA and USDA recommend that you still cook the egg base mixture. However, if you’d rather skip the cooking portion, you can make eggnog without the eggs altogether. It may sound a bit tedious to have to cook the egg base mixture if you are using eggs in your homemade eggnog, but it’s better to be safe than sorry. This column was reviewed by Abigail Snyder, an assistant professor and food safety field specialist for CFAES.